This is not a nutritous, good for you, low fat kind of recipe. It is however, the kind of recipe that makes you want to lick the bowl, so it is well worth making. Every year after our annual strawberry picking trip we make strawberry ice cream. To me nothing says summer like fresh, homemade strawberry ice cream. I honestly don't usually like strawberry ice cream. 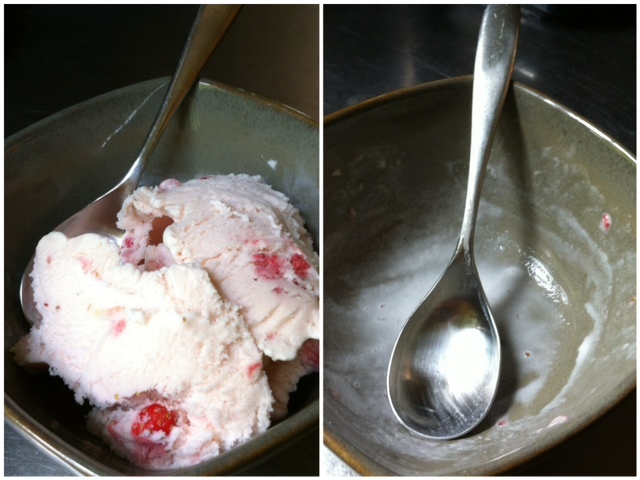 I would never order it if I was out, but homemade strawberry ice cream is one of my all time favorites. We started our ice cream by taking some strawberries (about a pint) cutting them up and putting them in a bowl with a little sugar (1/3 cup) and some lemon juice and putting them in the fridge for about an hour. This helps to mush up the strawberries and get them ready for the ice cream. While the strawberries were chilling, the Bee and Bean helped me make the ice cream base, for this we used the Ben and Jerry's Sweet Cream Base recipe. I mean how can you really go wrong with Ben and Jerry's recipe. We mixed 2 large eggs into a bowl with 3/4 cups of sugar. When they were fully blended we added 2 cups of heavy cream and 1 cup of milk. Once the strawberries had been in the fridge for a while I took them out and mashed them a little with a fork. The Bee then stirred the strawberries into the sweet cream base. I poured the whole mix into our ice cream maker and let it go for about 20 minutes, at which point I took it out, put it in a container and then in the freezer to set up a little more. If you don't have an ice cream maker you could always try the ice cream in a bag method. That is on our summer bucket list! 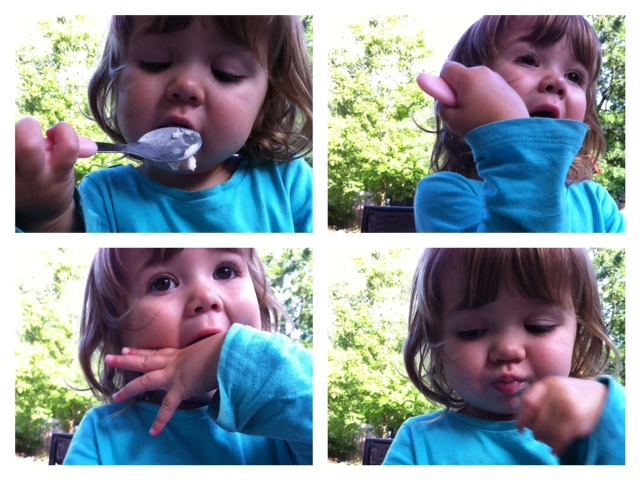 The Bee actually declined the ice cream, she doesn't always love cold desserts (does anyone elses kids do this?) The Bean on the other hand... well I think these pictures say it all.